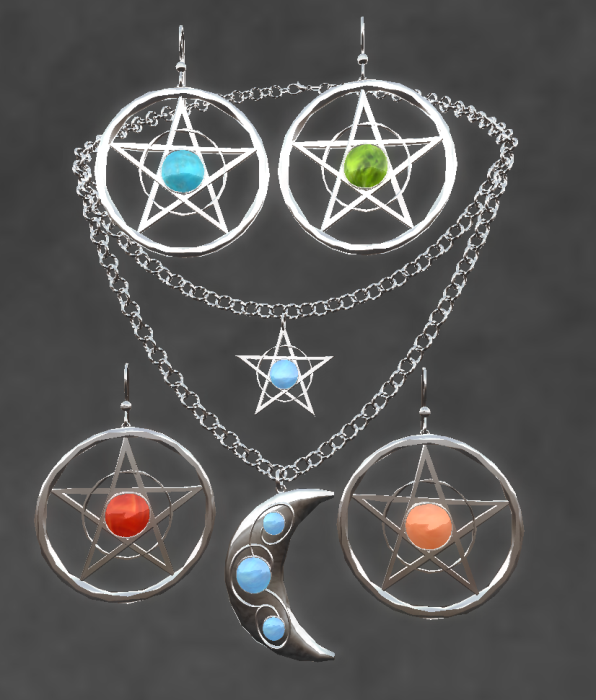 There's a new release at ELEMENTAL JEWELRY--The MOONGLOW NECKLACE & EARRINGS. This beautiful set includes a double stranded silver necklace with a silver star hanging on the shorter chain, and a silver moon on the longer chain. Both the star and the moon are set with texture changing stones in TURQUOISE, BLUE MOONSTONE, PEACH MOONSTONE, GREEN PERIDOT, or FIRE AGATE. The matching silver earrings include the star motif with texture changing stone. This is a really beautiful set that I've enjoyed wearing. It looks great with jeans and a t-shirt, with a pretty poufy dress, or with a fairy/elf outfit. The necklace is priced at L$100, and the Earrings are L$80. While you're at ELEMENTAL, have a look at the LOW Sale. The Letter of the Week is "F"--so the Floral Elegance retro pearls with floral motif are on sale for a mere L$95 per set (necklace & earrings included). Skin: Your Skin & Your Shape Sole Reborn. Hair: Truth Lulu hair in latte. Dress: Swansong Mirage dress in ice. I'm at: Crommhold--a gorgeous sim that is worth a visit.